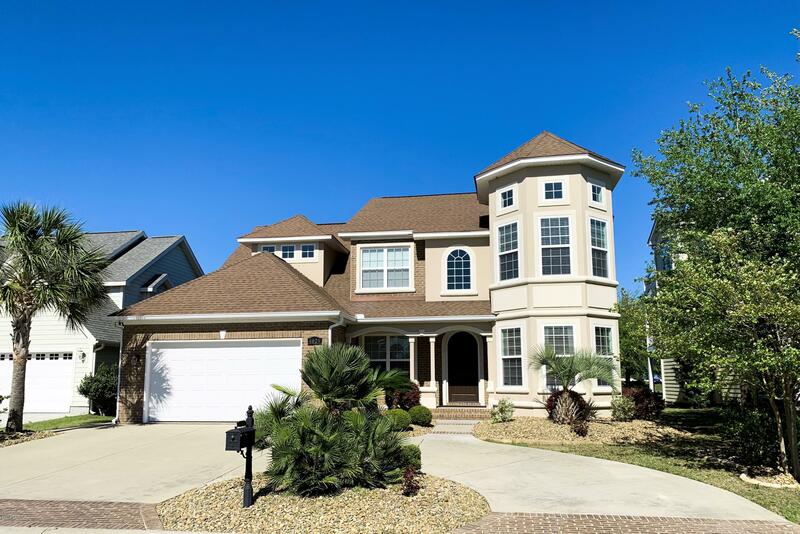 This gorgeous energy efficient home located in the dunes club is southern beach living at its finest. The hand scraped bamboo floors, custom cabinets and custom built-ins are excellent craftsmanship. The home is located in a family friendly neighborhood within walking distance to the beach on69 acres. Your new leed certified home has solar panels and 2 backup tankless rinnai water heaters. All five bedrooms have walk in closets and private baths. Large bonus room over the over sized three car garage could be used as a 6th bedroom. Two master suites and two laundry rooms one located on the first and second floor. The upgrades on this home are too many to list! Location, location, location. Situated 4/10 of a mile from the sandy shores of the atlantic ocean in the arcadian shores community. This home is situated on a large corner lot & surrounded by mature hardwoods & landscaping. The home offers over 5600 square feet consisting of 6 bedrooms, 3 full baths & 3 half baths; a large, fully equipped eat-in kitchen w/lots of cabinet space, formal dining rm; living rm w/gas fireplace, family rm w/gas fireplace, carolina rm, laundry rm, 2 bonus rooms, attached 2-car garage as well as a 1. 5 car detached garage. Ornate moldings like chair rail & crown throughout the home. Floor coverings consists of hardwood, ceramic tile & carpeting. There are 2 master suites and both are located on the 1st floor. Upgrades include solid surface countertops to include granite; cedar trimmed walls; coffered, box beam ceilings. Relax on the back patio underneath the live oaks or take a short walk to the beach. This home has it all and is located in one of the areas more desirable beachfront communities. A great home at a great price! Square footage is approximate and not guaranteed. Buyer is responsible for verification. Nice 6 bedroom/4 bath across the street from the ocean. Features include tile floors,all appliances and complete furnishings. Turn key and ready for new owner. Close to beaches, shopping,dining and entertainment.